It seems that tiny house movement is sweeping up the nation and home improvement channels and the trend is only growing. In many areas, real estate prices are completely out of reach for young people and wishing to downsize empty-nesters. There is a tremendous interest in custom and prefab tiny houses, tiny house floor plans, pre-built cabins or small log cabin kits, DIY storage hacks, and decoration ideas for small spaces. For a number of people, going “tiny” is a good choice to pay off their debt faster since loan consolidation doesn’t help a lot if you still have a huge mortgage hanging over you. There are numerous regulations for movable and stationary tiny houses and in order to legally own and live in one, you must be aware of them. So, whether you are shopping for custom or prefab tiny houses or looking at floor plans offered by tiny home builders, make sure you check all legal aspects of the law regarding tiny houses so there are no surprises in the future. What are the pros and cons of owning or building your own DIY tiny house? Downsizing may mean having a reduced cost of living (including mortgage, paying off debt faster, property taxes, utilities, etc). There is less space to maintain and clean as well as fewer options for stuff to accumulate which is great for those pursuing a minimalistic lifestyle. A tiny home is an intimate space that can bring the whole family closer together. It is a ‘greener’ living as tiny house dwellers are usually ecologically-minded bunch concerned with reducing their carbon footprint. Tiny house trailer (on wheels) may be an adventurous undertaking allowing you to explore and see the world before settling down – take a look at this collection of 17 tiny homes on wheels that people built for $12K – $25K including appliances. It is more affordable than your regular 3 bedrooms, 2 baths real estate in the suburbs, as you can build it yourself: design your own tiny house, order prefab tiny house kit, or buy an existing dwelling in a tiny house community. As the initial housing cost is less (between $19,000 and $60,000, on average, depending on its size and finishes) you can really splurge on the land and put it near the lake, in the mountains, or right at the ocean front – but make sure to check the legal issues first. If you pay cash for a prefab tiny house kit or save money and slowly build your own tiny custom home, you can completely eliminate the mortgage costs. These savings, over a long period of time, are huge (hundreds of thousands), as the biggest portion of your mortgage payment for the traditional real estate property goes towards the interest. Just think of all the trips you may take! If you invest in a moveable tiny house on wheels, it can move with you if you are relocating for a job offer or just decide to change the scenery. If your tiny home is portable, it may be legal living in it on an employer’s land, if he/she allows it. This is another way to use accessory dwelling unit (ADU) laws to your advantage. Tiny spaces can be extremely energy-efficient as you can equip them with solar panels, compostable toilets, and water conservation hacks. Your total house utility bill can be a quarter less than one of the traditional median home. Getting and assembling a prefab tiny vacation home, so you can live in it temporarily, is a great way to experience a tiny house movement without completely uprooting your family and drastically changing your lifestyle. You can order a prefab A-frame house kit and build a tiny cabin in your favorite vacation spot on your own piece of land if you follow the local laws and ordinances. You may even rent it out to offset costs when your family is not using it. There are complex legal issues to consider, as well as local ordinances, building codes, and regulations, so before investing any money into attractive cheap tiny house kits, do your homework and research all the legal aspects of that undertaking. Your ROI (Return On Investment) may be zero-to-none if you decide to sell your tiny home later, as it may seem a very popular growing trend but there are still fewer buyers interested in premade or custom tiny houses vs regular family homes. You must be prepared to own it as your ‘forever tiny home’ or have it on the market for a long time while searching for a buyer. The size does matter when it comes to hosting a dinner party or having house guests, so be prepared that certain entertaining ideas will become impossible in your tiny dwelling unless you place it in a climate with no bugs and perfect temperature all year round so you can utilize outdoor space to its fullest. A tiny house may be perfect for one person or a couple but what if you are planning to have a baby? There is no room for expansion or growth, as well as picking up new hobbies may become problematic. Sometimes, a tiny house is just too small for your situation. Storage may be an issue, especially if you are surrounded by a big piece of land that you’ll have to maintain. Whether you will have to hire someone with the equipment to clear the snow and mow the grass or come up with storage for your tools and equipment, including any hobbies and activities you may enjoy (fishing gear, canoe, snowboards, skies, etc all take space). Make sure you consider possible storage options as well or you may have to pay for an extra storage unit. It may not be cheaper after all, when all the expenses are summed up. As in one of the episodes of a ‘Tiny House hunters,’ a tiny houseboat came with a docking fee of $995 a month on top of $65,000 sticker price. If you have a tiny house on wheels, you may have a parking fee and utilities hook-up fees. If you a digital nomad, you can’t live without high-speed internet, which is another cost to consider. Some cities have ordinances against RVs so you must move your tiny house trailer often or face the steep fees. Note that the kit does not include AC/heater. Eagle Point is a truly unique kit cabin model which is a perfect example of a modern tiny house. In addition to recreational use, it can also be a stand-alone retail space or office, or a hybrid home/business. This design may look great in urban areas where most traditional cabins might look out of place. Though technically it doesn’t qualify as a ‘tiny house’ (it is more than 400 sq.ft) for a family it may be a bonus that this spacious cabin can be customized to function as a primary residence. For colder climates, tiny home builders recommend the Extra Wall Insulation Package that comes with additional cost. You must put into consideration that due to the size and height of the structure, it is recommended to hire a professional crew for assembling the kit. Foundation materials under timbers such as cinder blocks, for example. The estimated cost for those items is around $650 – $1,200 depending on the type of roof, the type of site, and foundation type you may prefer. This is a premade tiny house KIT, meaning there are wall planks, doors, windows, floor, and ceiling/roof boards and the hardware inside the kit. You would need to purchase and install all interior furnishings and appliances like a toilet, shower, kitchen sink. 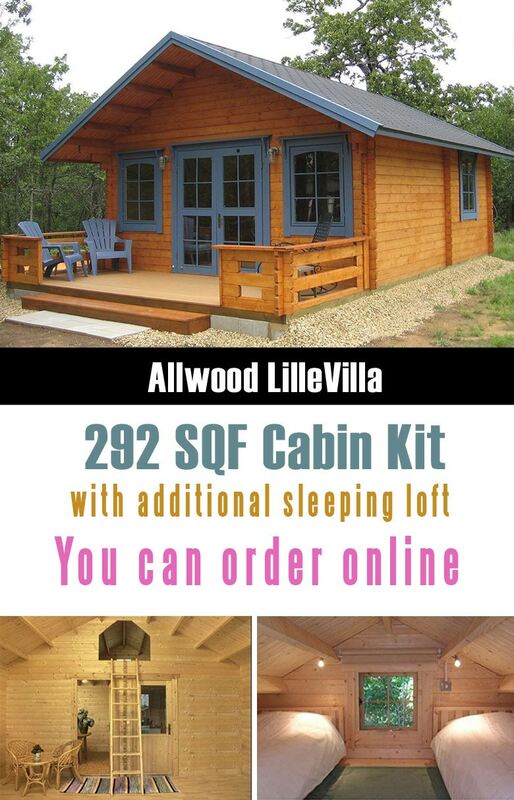 Allwood Cabin Lillevilla Getaway is a high-quality multi-purpose solid wood cabin. With 292 Sqf inside floor area plus a sleeping Loft (which is not part of the 292 Sqf due to limited height), Getaway is large enough to function as a summer house, home office, or even a stand-alone retail building. By adding the utility hookups, this cabin can be converted to a residence. For colder climates, it is recommended to add extra insulation. Assembly of this solid wood cabin takes 2-3 days for two adults. Do it yourself simple step-by-step directions come with the kit and only minimal tools are needed. 3. Tiny Home – Park Model RV: Ultimate Vacation Home or Weekend Getaway, 15 x 26, 1 Bed, 1 Bath, 399 sq.ft. This Tiny home is perfect for a weekend getaway, vacation cottage, or everyday living. It is 1 Bedroom, 1 Bath, 399 sq.ft. Includes covered front porch, pine accents, tile flooring, decorative barn door, kitchen appliances, and window coverings. This tiny house is designed to be lived in all year round and has R21 level insulation in the roof and R11 in the walls and floor. The home will come with the refrigerator and stove as a standard feature. 4. Prefab Tiny Home – Park Model RV: Ultimate Vacation Home or Weekend Getaway, 12 x 36, 1 Bed, 1 Bath, 399 sq.ft. This tiny home is perfect for a weekend getaway, vacation cottage, or everyday minimalistic living. The Cozumel model is 1 Bedroom, 1 Bath, 399 sq.ft. It is a movable tiny house on wheels. The high ceilings, smart layout, and lots of windows make it feel very spacious. The kitchen area looks like a very efficient and airy space, though you have to purchase and install all the cabinets and counters to make it suited even for a gourmet cook. Are you a fan of hygge and Scandinavian-style minimalistic living? The Allwood Ranger cabin is a product of the Scandinavian cabin design focusing on practicality and functionality. Spacious 259 SQF main floor area and a large 168 SQF loft, which is nice to have for additional sleeping space (or storage). As the roof angle is ideal for solar panels, this cabin can become an off-grid retreat for the environmentally-minded person. Thicker than usual (2-3/4″) wall planks make it very energy-efficient and well-suited cabin even for colder climates. It is good to know that the assembly of this solid wood cabin takes about 2 days. Due to the height of this cabin, tiny home builders strongly recommend it as a “two adults project” for safety reasons. DIY simple step-by-step directions come with the kit and only minimal tools are needed. This Cabin Kit includes all the parts and hardware except the roof shingles and foundation materials (not included). The Allwood Pioneer is the very first model (to be put on wheels by the buyer or set as a standard cabin) of the Tiny Home Series by the builder Allwood. It is a budget-friendly option for a small DIY tiny home which comes with free shipping. Just like the standard Allwood Cabin Kits, the Tiny Home kits are shells. They contain all wood parts, door(s) and windows but there are no furnishings. You also need to purchase the trailer (if you want to put it on wheels) and the final roofing material, such as shingles. Each kit is pre-cut for the door and the small loft window, but there are no cut-outs for standard size windows on the walls. Those windows come with the kit and you can decide where to install them. The cutout for each window can be made while erecting the walls or later. Allwood Tiny Home Kits are intended for customers who want to set up the frame and the roof in a couple of days and start furnishing the structure right away. This process greatly shortens the usual building time. In addition to the standard hardware (screws, nails, door lock, door/window hinges, and handles), our Tiny Home models also come with approx. 120 long stainless steel screws. Those will secure each layer of wall planks to the previously added layer. For wall insulation, the builder recommends adding studs and either wall siding or any other material of your choice. Fill the cavity with foam or Rockwool. Electrical wiring and plumbing can also be concealed inside the insulation layer grid. Allwood Solvalla is a garden house kit made from high-quality Nordic wood. This timeless design is an alternative to classic log cabin structures. It works well in a variety of surroundings and would be perfect as a garden house, studio, or a small guest/pool house. Assembly of this solid wood structure takes a full day for two adults. Unique style makes it a focal point of any garden. Outside measurements 7’11” wide x 15’9″ long; total floor area 117 SQFT. Structures on wheels are exempt from permits in most states. Allwood Mayflower is a modern interpretation of the wagon without the arduous journey to the West. This cozy cabin will be a focal point of any garden or yard. It is built from high-quality Nordic wood. Assembly of this solid wood structure takes a full day for two adults. DIY simple step-by-step directions come with the kit. What would you need to assemble it? Another adult (to make it faster and safer), measuring tape, level, box cutter, drill, hammer, screwdriver, saw, pliers, and ladder. This Cabin Kit includes all the wood parts and hardware except the roof shingles. WZH Prefab House company also known as WZH Modular House has a few new listings on Amazon hoping to attract Tiny “Green” Enthusiasts with its optional solar panels kit. $17K price is just for the main container with doors, windows and electrical system. Adding the solar system will set you back for $5,000. An expandable hydraulic system is around $3,600. If you are on the market for all the appliances shown on the photos plus sofa, table, and high-end toilet then be ready for the final installment of $4,200. Paying a total of $30,600 for this beautified 20 FT x 40 FT shipping container with fancy appliances can be risky. 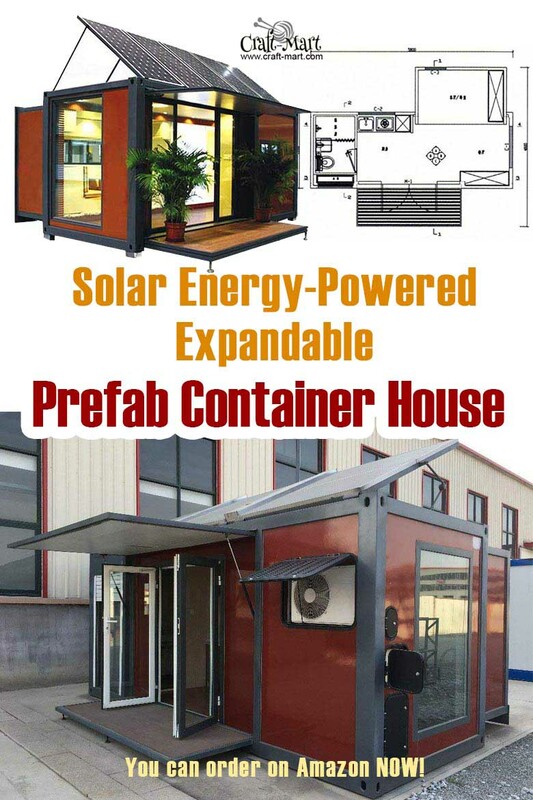 On the other hand, if you will order this prefab container home through Amazon not only the risk will be minimized but also the price will be much better (around $25,000 plus $1,000 shipping at the time of writing). Check out this model as well. For some reason, it is priced lower (~$1,000 less). 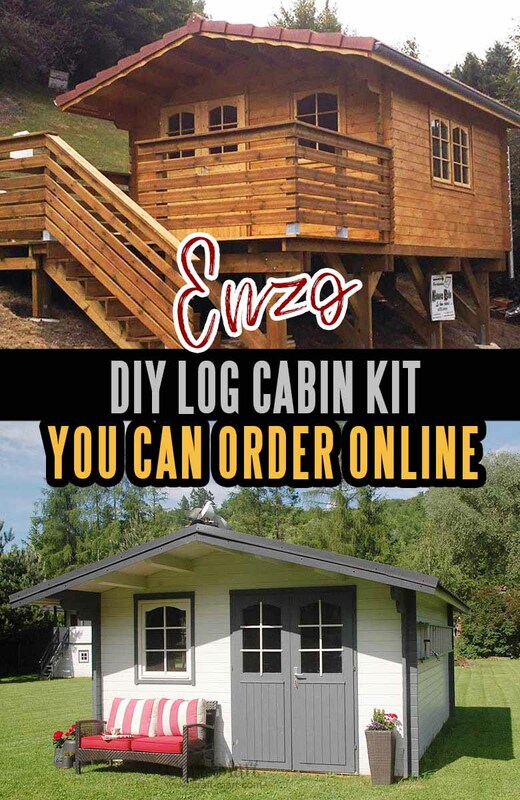 The Enzo log cabin kit for DIY assembly comes with vaulted ceilings of more than 8 ft. of headspace provides 189 sq. ft. of livable space and includes French style double doors. High quality kiln-dried Baltic spruce wall logs and a sturdy purlin roof system with 3/4 in. tongue and groove deck boards ensure that your investment will last for years to come. Exported from Estonia through one of the US dealers, the Enzo is simply perfect for DIY enthusiasts. Why would anyone choose this Estonia-made log cabin? Well, in the EU Estonia is famous for beautiful and extremely affordable log cabins that are made with German-like quality. The Enzo prefab tiny cabin kit is the perfect example of such outstanding craftsmanship. Check out this beautiful cabin here. *Please, take note that roof covering material and flooring are not included. Are you interested in finding a local tiny home builder? Take a look at our updated US, Canada, and EU Directory of Tiny House Builders. Do you want to live in style? Take a look at these beautiful and really affordable prefabricated tiny homes from EU that you can order to be shipped to the US! 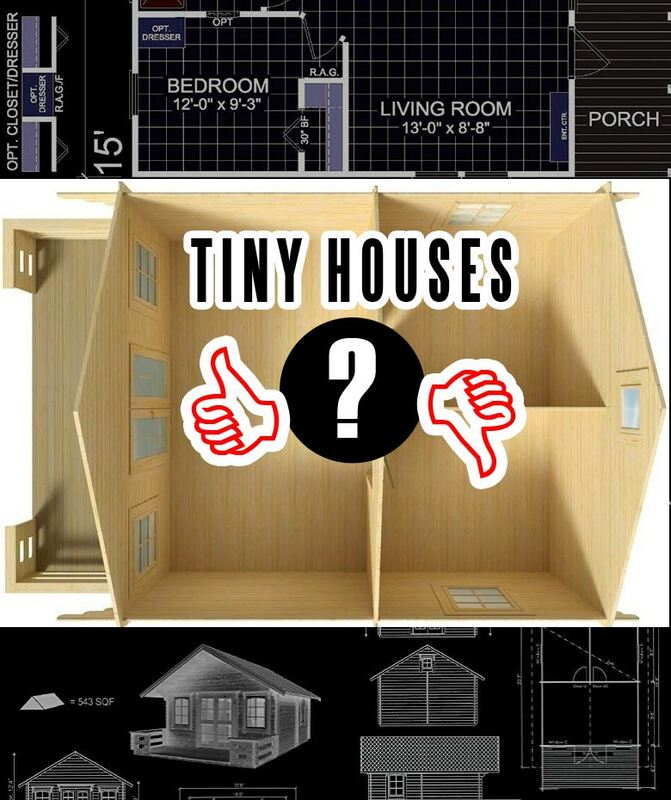 Would you like to build your own tiny house?